We would like to express our gratitude for your interest in S&W Outfitters, Inc. Montana's big game and fly fishing experts. We hope you will join us next year for the trip of your dreams. Please call us to discuss any questions you may have about our hunts or fishing trips. Our goal is to provide our hunting and fly fishing guests with a first class trip. Weather for mule deer, whitetail deer, antelope, or elk hunting, as well as fly fishing for trout. We offer a experience to be remembered long after the trophy mounts and photos have faded and lost their splendor. When you are looking for a fly fishing experience that will last a life time, let S&W Outfitters be your first call. Some of the best fly fishing the world has to offer is right here in Southwestern Montana, Where Brad Hanzel and his guides can help you to experience the thrill. Giving you fishing opportunity at its best on legendary waters such as the Madison, Yellowstone, and Missouri, we specialize in half and full day fly fishing trips. We offer the classic Drift Boat and Walk Wade trips, to the unique and unforgettable Jet Boat tours for large Rainbow Trout on the famous Missouri, Gulper fishing on scenic Hebgen Lake, or seeking out large Brown Trout on the Stone. For fly fishing at is best choose us as your local connection. Whether it is your first time fly fishing or you are an experienced angler we can cater a trip for you and your group. It is never too late, call to set up your appointment with Mr. Fish... At S&W Outfitters, Inc. we choose to offer you the best we can. Our guided hunting trips are 100% fair chase, with no games, fences, or guaranteed kills. 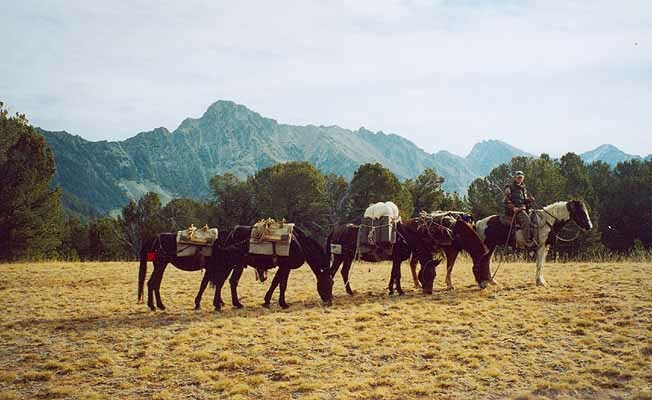 All hunts are fully guided and include transportation from the nearest major airport, in field transportation, in field care of game, guide service, hot and hearty meals with warm, dry cabins and wall tents. Our Montana licensed guides give 100% to insure that you have a safe, successful and enjoyable outdoor experience during your stay with us. S&W Outfitters, Inc. is licensed under the Montana Department of Commerce, Montana Board of Outfitters (Lic.#2113) and follow all game laws set by the Montana Fish, Wildlife, and Parks. *Hunting: Archery and Rifle for Elk, Whitetail Deer, Mule Deer, Antelope, Mountain Goat, Bear and Merium Turkey. Offering: Private Land and Backcountry Hunts *Fishing: Madison River, Yellowstone River, Missouri River, Big Spring Creek, Southwest and Central Montana. Offering: Jet Boat, Drift Boat Floats, and Walk Wade Trips *Merchant Mariner Credential Jet Boat fishing at its best.